The Kaiserslautern Military Community’s 27 new chief master sergeant selectees pose for a photo during the Chief Recognition Ceremony on Ramstein Air Base, March 23.The Chief Recognition Ceremony is an event that highlights the newest chief master sergeant-selects’ accomplishments and acknowledges their ability to attain a position within the top one percent of the U.S. Air Force enlisted force. The Chief Recognition Ceremony is an event that highlights the newest chief master sergeant-selects’ accomplishments and acknowledges their ability to attain a position within the top one percent of the U.S. Air Force enlisted force. U.S. Air Force Chief Master Sgt.-select Jason David, 86th Airlift Wing Public Affairs senior enlisted advisor, believes this ceremony is the culmination of the work he’s been involved with since being an Airman. U.S. Air Force Chief Master Sgt. Sean Nelms, 786th Civil Engineer Squadron superintendent, agrees with David’s sentiment and how important their role is in Airmen development. Putting on this last stripe allowed Nelms to be the chief he observed in his early U.S. Air Force career. Despite some sacrifices Nelms encountered while holding the highest enlisted rank, these obstacles never made being chief any less important to him. Throughout the ceremony, Brig. Gen. Mark R. August, 86th AW commander, Chief Master Sgt. Ernesto Rendon, 86th AW command chief, and Chief Master Sgt. Phillip L. Easton, U.S. Air Forces in Europe and Africa command chief, imparted their words of wisdom with Kaiserslautern Military Community’s 27 new selectees before the night came to a close. An idea was reiterated several times by these guest speakers. The notion that it doesn’t matter how long an individual has held the rank of chief master sergeant, because the prestige and respect is unfaltering. At times, this level of respect the rank carries may cause roadblocks in communication with more junior Airmen but Nelms makes it clear that communication with a section’s chief should be encouraged. David agrees and expands on Nelms’ ideas on why good communication with your chief is important. The moment the ceremony concluded, the new chief-selects knew it was time to get back to work and resume advocating for their Airmen, this time with an even greater sphere of influence. The new chief master sergeant selects are Chief Master Sgt. 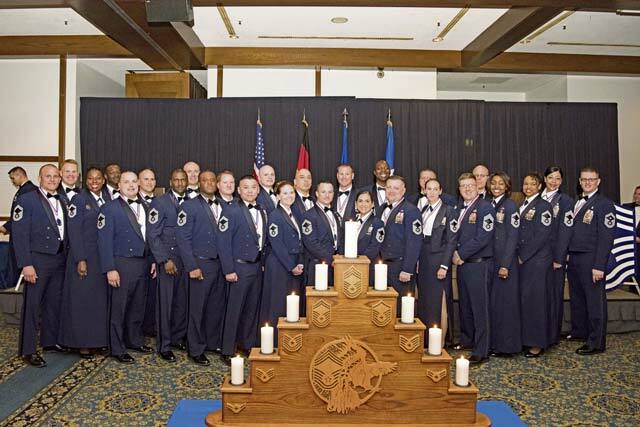 Melanie Townsend and Senior Master Sgts: Gilda Alexander, Stephen Bennett, Erik Bensen, Matthew Canoy, Jason David, Yamil Davila, Ernest Dinolfo, Eric Edwards, Brean Fitzsimmons, Carteralynn Ford, Destiny Hager, Jason Hammel, Nakia Hartson, Joshua Lackey, Peter Martinez, Fedrick McBride, Timothy Miller, Jennifer Nalls, Jason Passmore, Christopher Sandlin, Joshua Skarloken, Corey Strother, Larry Tate, Clifford Thebodeau, Chet Tonge and Brian Witte.